Samsung UE55JS8500 review | What Hi-Fi? The UE55JS8500 marks the first of Samsung’s three flagship SUHD ranges, comprising nine models in total. Like the brand’s Galaxy S smartphone range, the acronym’s arbitrary ‘S’ stands for whatever you like. Samsung says these sets redefine what TV is capable of in terms of brightness, contrast, detail and colour reproduction. But the SUHD talking point here is the company’s take on nano-crystal technology – a thin layer of tiny crystals in the display panel that emit light in various colours according to their size. Samsung says it offers 64x more colour expression and 2.5x more brightness than traditional tellies. They may be hard stats to verify, but we’re duly impressed by what we see. 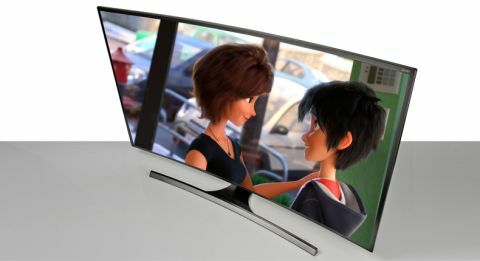 Across resolutions (Ultra HD to DVD), the Samsung produces a striking picture. With every facial feature dissected and object so precisely drawn, 4K House of Cards (on Netflix) is an engrossing watch, even if the drama isn’t really your cup of tea. Switch to the first episode of Marvel’s new Daredevil and even in the title sequence the razor-sharp lines and the way the pink graphics leap off the screen blow us away. If we can get that quality from streaming, we can’t wait to see what a 4K physical disc will deliver. For now, we’ll have to make do with Full HD 1080p Blu-rays, but in light of the Samsung’s performance this hardly feels like a compromise. Although there is a clear drop in resolution from 4K, the picture is still remarkably defined; its sharp yet subtle outlines prove more realistic than on the LG, and it has no problem filling the 55in screen with fine detail. Play the Oscar-nominated Whiplash and you can see every crease in J.K Simmons’ screwed-up face, and each sweat bead on Miles Teller’s. Colour reproduction is the Samsung’s forte, its palette rich, solid and truthful. Whereas the LG’s delivery brings a touch of glitz and glamour – brass instruments resplendent, the wooden cello a shiny reddish-brown – the Samsung has deeper, more natural hues. Contrast is exemplary too, the blacks especially impressive. The sea of suits in the orchestra is properly deep, without sacrificing detail. Drop down to Star Trek Into Darkness on DVD and the TV upholds the standard very well. Though we initially suffered a few motion issues, experimenting with picture modes revealed that turning on ‘Auto Motion Plus’ to ‘Standard’ sorts them out. The picture becomes notably steadier as Spock chases Khan through the city. The Freeview HD tuner (there’s Freesat HD too) doesn’t let it down: high-def channels draw no complaints, and SD channels are still perfectly watchable: clean with reasonable sharpness, insight and colour punch. Samsung keeps active 3D onboard, although no glasses are supplied in the box this time. Curved screens account for almost a third of Samsung’s 4K models this year, not to mention its entire SUHD line-up. The stylish TV looks like it’s merely suspended in the air above the metal stand (curving parallel in front) but rest assured it’s sturdy. The finger-width bezel, which the company calls ‘chamfer’, is supposed to increase perceived picture depth. We’re not sure about that, but it does make for a smart frame. In its latest efforts to futureproof its TVs for the yet-unclear, work-in-progress standards of 4K, the lion’s share of connections are housed in a pencil-case-sized One Connect Mini box, which plugs into the back of the telly but unlike the bigger version supplied with higher-ranging models, can't be used for future upgrades. Here you’ll find all four of its HDMI 2.0 (ie. 4K-compatible) sockets, two of its three USB inputs (the other is on the TV’s back panel) and a digital optical output. On remotes, the Samsung forces you to pick a favourite. The traditional vanilla wand – more functional than flashy – is much the same as last year’s, while the smart one has seen some revisions. It’s no longer pebble-shaped, instead rectangular and curving at the ends like an old-fashioned phone. It looks and feels the part, and is lovely to use. An on-screen pointer activates when your thumb is rested on the right button, bringing up channel and volume operations on-screen. There are some hidden shortcuts – holding down the ‘Extra’ key brings up the EPG, for example – so it’s worth flicking through the literature. Samsung set the benchmark for app services in 2014, and it’s a reputation it is likely to preserve. You can get your 4K kicks from YouTube, Netflix and Amazon Instant Video (that’s the most on the market at the moment). The new driving force behind its smarts is its new open-source platform, Tizen. Like LG’s WebOS, it features snazzy pop-up tiles overlaying the screen. Here you can access apps, channels and other content. The tabs can collapse into a full-screen page of apps, all nicely broken down into categories. Input selection runs along a bar at the top of the screen, as do menus for settings, EPG and a new feature called Multi-link; essentially, which lets you split the screen in two, so you can watch a programme and check news headlines simultaneously. If you’re already thinking about partnering kit, we wouldn’t bother buying a soundbar unless you’re going to spend serious money (on the £800 Yamaha YSP-2500, say). We’re pleasantly surprised by the Samsung’s sound, which is full, rich and powerful. The thrashing of cymbals during Whiplash isn’t the wince-inducing affair that it usually is through a flatscreen TV’s speakers. Drum strikes are punchy, trombones prompt decent bass response, and J.K Simmons’ voice comes through deep and solid. Even playing music stored on our network (the set is DLNA-compatible) is entertaining, and that’s rarely the case with any TV. Overall, the Samsung UE55JS8500 is a dream to use. Both fantastic to watch and enjoyable to listen to, it is a beauty to behold. Perhaps that ‘S’ in SUHD should stand for ‘success’. Or even ‘special’.